Pile, carpet, or loop stitch are terms used for a raised relief fabric made on KMs using both beds, with or without programmed patterning motifs on either bed. Two color patterns are sometimes also called “punch pile”. Depending on machine brand and on thickness of yarn, loops may be formed every row or every other, varying the pile density. Beds are always at half pitch, the same setting used for every needle rib. The “needle rule” is disregarded. First and last needle are always on the non patterning bed, to anchor down any loops close to the edge of the fabric. In machines with automatic end needle selection, the function is cancelled. 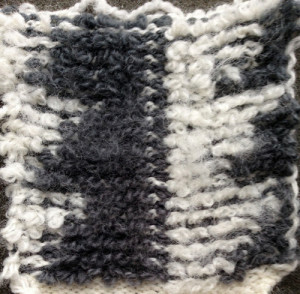 Some yarns and designs will even tolerate loops being dropped at the end of knitting. Sometimes dropping them every few rows will work. If any yarn splitting or fussy knitting off because of fiber content occurs, then dropping stitches may be needed after every row of loops formed. If using multiple colors of yarn on either of these 2 brands, having them equal gauge/weight is helpful. The Passap knitting machines as well as the Brother, did not have a built in yarn feeder to facilitate knitting this fabric such as that possible in the Studio brand. Particularly with the advent of the E6000 Passap model, for a while there was keen interest in how to produce similar fabrics. Susanna Lewis was among the first to describe knitting pile across multiple brands, whether punchcard models, or, later, electronics. The E 6000 has some built in technique choice options for knitting and automatically adding blank rows in charts where needed. This allows for the locks, empty of any yarn, to travel from and then back to the color changer achieving stitch dropping. 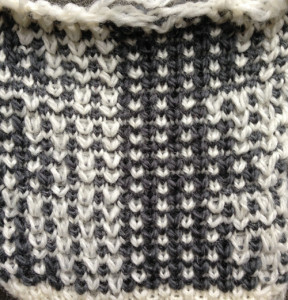 My preference is to work with stitch dropping tools instead of the extra rows “knit” without yarn. Also, if the goal is to work between KM brands, keeping the separations more compact is practical, particularly if one plans to use the end chart with a punchcard or a mylar sheet for programming. I had tried some pile fabrics on the E 6000 in the past, found the knitting a bit loose for my liking, but by lightly felting (wool yarn) the result, I had a stable, attractive fabric that could easily be cut and sewn in combination with other knit companion DBJ fabrics. 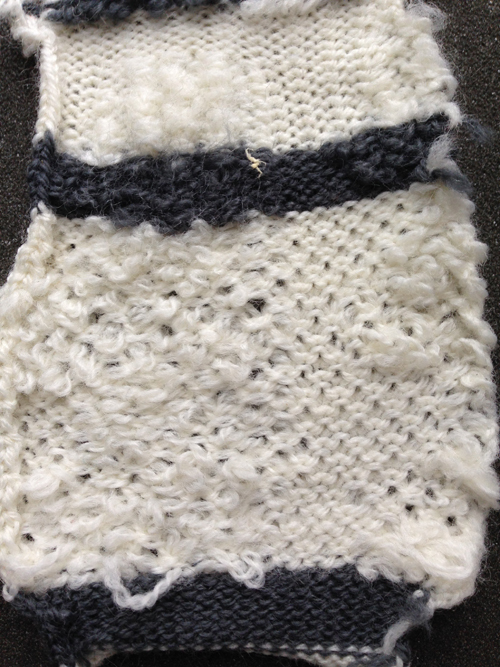 Another option in wearables to add stability may be an iron on knit interfacing used on areas of pile knit. This time I pushed the back bed tension as much as physically possible with the yarn used, and was happier with the result. The only problem I encountered was in thinking I could knit a few extra rows on the back bed only before dropping the knit off the machine for inspection. The old adage still applies: if more than a row or 2 are to be knit across all stitches on any single machine bed, each yarn has an optimum tension required for stitches to form properly. Pushing limits will lead to problems. I had a lovely lock jam. For wide ribs the same principle applies: the more stitches on either bed, the closer tension on that bed to what number would apply to single bed stocking stitch on that bed. CARPET STITCH KNITTING ON PASSAP E-6000 with release stitch tool. 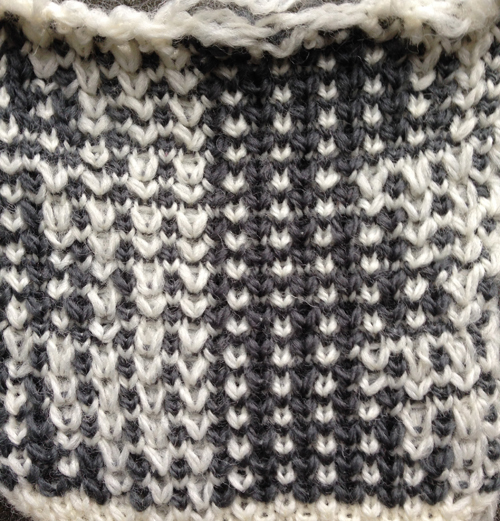 Use any 2 color fairisle pattern from the pattern book that accompanies the machine. Both Passap manuals are now available for free download online. I randomly chose # 1407 for my test. Start with all stitches on the back bed. 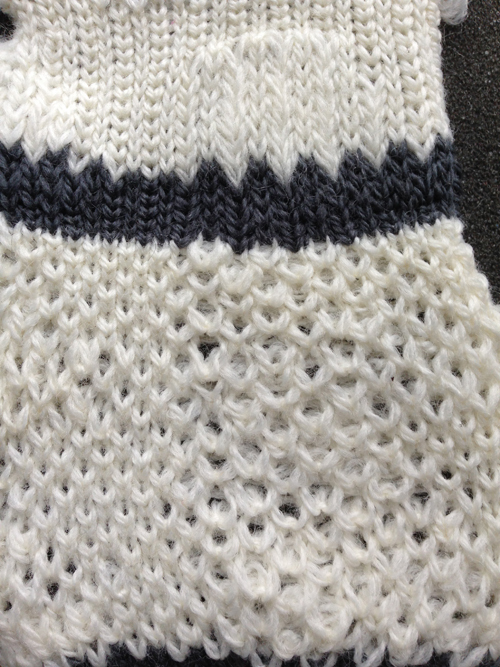 If you have done ribbing, transfer front bed stitches to back. For test swatches, if open stitches do not matter, it is possible to do a quick single bed cast on on the Passap in a couple of ways, the “broken toe” cast on will work across brands. Have an extra needle and pusher each side on back bed when setting up work for patterning. Back bed tension as tight as possible, front bed 1 – 1.5 tension numbers looser than back bed. As always test small swatch before committing to a larger one. 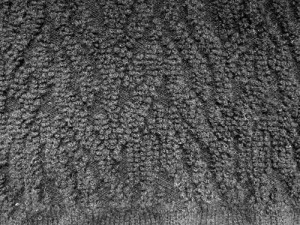 One color carpet stitch: Technique 256. Black strippers are recommended. I rarely if ever use black, go for orange first, sometimes combining with one blue or switching to 2 blues if the fabric calls for it. Ignore console instructions. Back bed is set to FX left arrow key <–, not BX as instructed. Do not use the AX setting by mistake. FX will tuck right to left, knit left to right (toward the color changer, which in Passap sits on the right side rather than on the left as in Brother machines). Knit rows help anchor loops. Back bed pushers are in 1 up, 1 down set up. Using one arrow key means the same selection is repeated for 2 rows before the switch is made to the adjacent pusher and the corresponding needle. The front bed is set to LX (slip) throughout. Racking handle is down (setting for every needle rib). Two rows are knit, then the front bed stitches are dropped (Passap knitting beds are in reverse position to Japanese machines set up with their ribbers). If loops are long they may need to be pushed between the beds before knitting the next row. Passap machines have pushers for this purpose, in Brother rulers or any number of tools may be used for the same purpose. Two color carpet stitch: Technique 185, black (or other) strippers, 184 may also be used, its graphic gives the added reminder for EO pusher set up on back bed. Back bed setting is the same as for the one color pattern, Front bed knits in LX throughout. 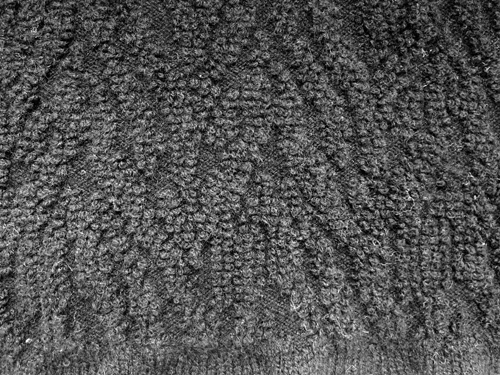 In theory stitches may be dropped every 4 rows. Some yarns may split and catch the alternate color requiring dropping after each color is used, others will tolerate much less frequent dropping. It is all an experiment to start with. Again: the back bed tension must be as tight as possible, the front bed at least 1.5 tension numbers higher until tests determine what is best for the yarn being used. Multiple strands of some thinner yarn may also be worth a shot. Weights are needed on the knitting, no matter what brand machine is in use. At the end of knitting pile, add anchoring rows of knit on back bed only (tension may need to be changed after a couple of rows), proceed as preferred. Previous posts with info on accessories useful for dropping stitches and loops 1, 2, 3.